Exactly one year ago today, I stood in front of the Lawyers Syndicate in downtown Cairo and watched as a few thousand protesters suddenly streamed into the area from the north, overwhelmed Egypt’s notoriously violent riot police, and pushed onward towards Tahrir Square. That mile-long march, which culminated with the protesters bursting through a human chain of officers and seizing the Square, was the most inspiring thing that I’ve ever witnessed, and it remains so. Long presumed to be politically passive, ordinary Egyptians bravely amassed with one simple demand: That decades of dictatorship had to end. When Hosni Mubarak resigned eighteen tumultuous days later, the Arab Spring had bloomed. Or so we wanted to believe. The reality of the past twelve months, however, has undone whatever high hopes one might have held. Egypt is now headed for radical theocratic, rather than liberal democratic, rule. And a befuddled Obama administration has failed to do anything to stop the coming disaster. IT IS TEMPTING to believe that things might have turned out differently had Washington worked harder to bolster the young revolutionaries who seemingly exemplified America’s own liberal values when they took to the streets last January. These brave activists, after all, had won America’s hearts to the tune of an 82-percent approval rating at the height of the revolt, and their photogenic faces carried the promise of a more democratic, friendly Egypt. But the activists were never who we hoped they were. Far from being liberal, their ranks were largely comprised of Nasserists, revolutionary socialists, and Muslim Brotherhood youths—an alliance of convenience for opposing Mubarak and, later, for denouncing the U.S.
Not that the revolutionaries were the horse to bet on anyway. Their continued reliance on street protests following Mubarak’s ouster angered the wider Egyptian public, which desperately wanted a return to normalcy. In late October—only one day before the registration deadline—they finally formed an electoral coalition, the Revolution Continues Alliance (RCA), to compete in parliamentary elections, but it was too late. The RCA won merely 2.35 percent of the parliamentary seats, and will play a minimal role in shaping Egypt’s political future. Meanwhile, Islamist parties captured nearly 70 percent of the vote by tapping into the Egyptian public’s religious sentiments and using their well-established social services networks to turn out supporters. The Obama administration, however, had already pegged its hopes on the Supreme Council of the Armed Forces (SCAF), which took power after Mubarak’s resignation with Washington’s approval—and reasonably so. After all, the military’s historic relations with Washington and its widespread support among the Egyptian public seemed to make it the ideal partner for shepherding Egypt toward a stable, democratic future. But there were early signs that the SCAF was far more concerned about stability than it was interested in democracy. Last spring, as sectarian violence rose considerably, the military hesitated to interfere in domestic strife for fear of inciting a backlash. It also granted a platform to radical Salafists, splashing their images across the front pages of Egypt’s state-run press and hosting them on state-run news shows. 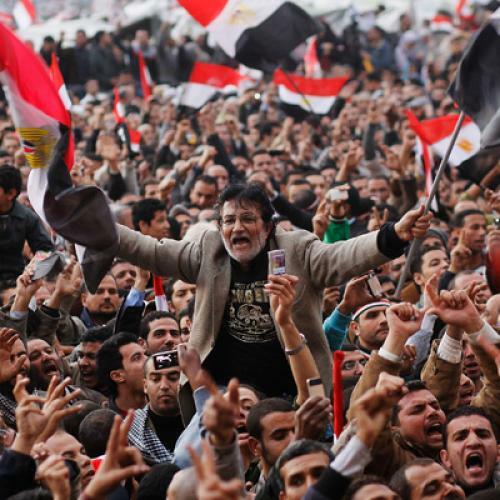 Shortly thereafter, encouraged by their reception, the Salafists began organizing politically—emerging from the elections eight months later as Egypt’s second most dominant political force. Then, when a sluggish transition towards civilian rule catalyzed new Tahrir Square protests in the autumn, the military unleashed an unprecedented crackdown, entirely abdicating whatever democratic credentials it could once lay claim to. Between October and December, the military killed at least 80 demonstrators and wounded hundreds, deploying armored military vehicles, snipers, and weapons-grade teargas again its own people, and manipulating the state-run media to incite civilians to take up arms against protesters. Meanwhile, the SCAF subjected at least 12,000 Egyptians to military trials and, in late December, stormed the offices of seventeen pro-democratic NGOs, many of which are U.S.-funded. As the SCAF’s repressive rule has undermined its legitimacy both within Egypt and abroad, the Obama administration has looked increasingly to the Muslim Brotherhood as a potential partner. Thus, administration’s policy of “limited contacts” with the Muslim Brotherhood, which it announced in June, expanded to diplomatic meetings with the organization in October, and Deputy Secretary of State William Burns met with the Brotherhood’s political leaders in January. The Brotherhood, the thinking goes, won a 47 percent plurality in the recent parliamentary elections, and Washington’s interests are hardly served by having hostile relations with Egypt’s legitimately elected leaders. This argument, however, is only half right: While Washington should maintain open lines of communication with the Brotherhood, it should have no illusions about the Brotherhood’s willingness to act as a partner on key American interests. In this vein, the Brotherhood’s leaders have said repeatedly that the organization intends to put the Camp David Accords to a referendum—a strategy that it apparently believes will enable it to sink Egypt’s peace treaty with Israel while escaping the blame. Brotherhood leaders have additionally called for banning bikinis, beach bathing, and alcohol despite the fact that these are essential elements to Egypt’s tourism industry, which comprises roughly ten percent of Egypt’s stagnating economy. The organization also supports new legislation that would limit foreign funding of NGOs, thereby undercutting Washington’s ability to aid pro-democratic organizations. Finally, and perhaps most consequentially, the Brotherhood intends to establish the sharia as the principal source of Egyptian legislation and criminalize criticism of Islamic law, thereby rendering Christians and secularists unequal citizens. INDEED, ONE YEAR after Egypt’s heroic revolt, Washington has no heroes in Cairo, only headaches. But rather than confronting those headaches, the Obama administration has consistently chosen the path of least resistance. Thus, the SCAF’s raids on U.S.-funded NGOs has not put a halt to the $1.3 billion in military aid that Washington sends to Cairo, and the Muslim Brotherhood’s blatant stances against key U.S. interests have gone unchecked. According to Brotherhood political leader Essam El-Erian, when the Deputy Secretary of State visited the organization’s Cairo headquarters in mid-January, the Camp David Accords weren’t even mentioned. Perhaps the administration is betting that recently reported negotiations between the SCAF and Muslim Brotherhood will yield an agreement that satisfies both parties and, at the very least, promotes domestic tranquility. If so, it would be a telling indicator of where things stand: a year after the ebullience of Tahrir, an alliance between military autocrats and radical theocrats is viewed, sadly, as a best-case scenario.